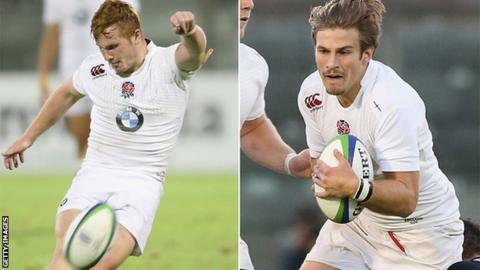 Championship side Jersey have signed centre Max Clark and fly-half Rory Jennings on loan from Bath. The 20-year-olds were both part of the England side which made the final of last year's Under-20 World Cup. "They will add real competition to our current playing squad," Jersey head coach Harvey Biljon told BBC Sport. "They are guys of real high calibre and have been training with Bath, so understand the professional environment," he added. Clark made his Premiership debut as a late replacement in Bath's opening-day win over Exeter in October and played three games in last season's LV= Cup. Jennings played one game in the LV= Cup last season and was twice an unused replacement in the Premiership last February. "This gives them an opportunity to not only play rugby but compete for a position week in, week out at Jersey," added Biljon. "Competition for places is always good, so we're excited to see how they drive our current squad and drive their training standards and playing standards."